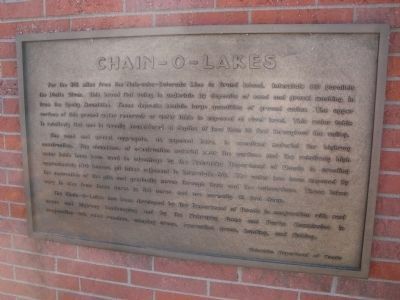 Chain – O – Lakes. —. For the 215 miles from the Nebraska-Colorado Line to Grand Island. Interstate 80 parallels the Platte River. This broad flat valley is underlain by deposits of sand and gravel washing in from the Rock Mountains. These deposits contain large quantities of ground water. The upper surface of this ground water reservoir or water table is exposed at river level. This water table is relatively flat and is usually encountered at depths of less than 10 feet throughout the valley. The sand and gravel aggregate, as exposed here is excellent material for highway construction. The abundance of construction material near the surface and the relatively high water table have been used to advantage by the Nebraska Department of Roads in creating approximately 100 borrow pit lakes adjacent to Interstate 80. The water has been exposed by the excavation of the pits and gradually moves through them and the subsurface. These lakes vary in size from three acres to 50 acres and are normally 15 feet deep. For the 215 miles from the Nebraska-Colorado Line to Grand Island. Interstate 80 parallels the Platte River. This broad flat valley is underlain by deposits of sand and gravel washing in from the Rock Mountains. These deposits contain large quantities of ground water. The upper surface of this ground water reservoir or water table is exposed at river level. This water table is relatively flat and is usually encountered at depths of less than 10 feet throughout the valley. and Parks Commission in conjunction with road ranches, camping areas, recreation areas, hunting and fishing. Erected by Nebraska Department of Roads. Location. 41° 6.411′ N, 101° 45.398′ W. Marker is in Ogallala, Nebraska, in Keith County. Marker can be reached from Interstate 80. Touch for map. 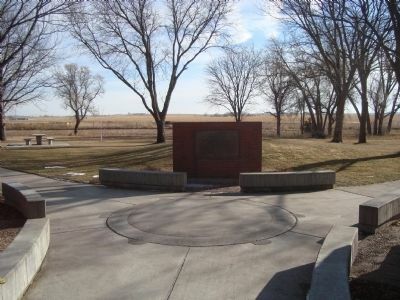 This marker is located at the Ogallala Rest Stop on Interstate 80. The rest stop is on the south side of the highway while heading east. Marker is in this post office area: Ogallala NE 69153, United States of America. Touch for directions. Other nearby markers. At least 8 other markers are within 3 miles of this marker, measured as the crow flies. Purple Heart (within shouting distance of this marker); Samuel David “Lep” Sanders (approx. 1½ miles away); Oregon Trail (approx. 1.9 miles away); Sand Hill Station (approx. 1.9 miles away); The Lincoln Highway (approx. 2.3 miles away); Interstate 80 (approx. 2.3 miles away); The Union Pacific (approx. 2.3 miles away); The Mormon Trail (approx. 2.3 miles away). Touch for a list and map of all markers in Ogallala. More. Search the internet for Chain – O – Lakes. Credits. This page was last revised on June 16, 2016. This page originally submitted on January 2, 2012, by Barry Swackhamer of San Jose, California. This page has been viewed 444 times since then and 7 times this year. Photos: 1, 2. submitted on January 2, 2012, by Barry Swackhamer of San Jose, California. • Bill Pfingsten was the editor who published this page.